One of the questions that I get asked at least every couple of months is what kind of basic tools do you use for SEO? The truth of the matter is that while I might use a specific tool to research keywords or a tool to watch traffic closely, I find that there are a few tools available, all of which are free and indispensable - and help me with my day to day projects. Whether you are looking at your competition, tracking your page rank, or looking to find a weakness in your site or blog, the following tools are an efficient way to get deeper understanding and conduct research. 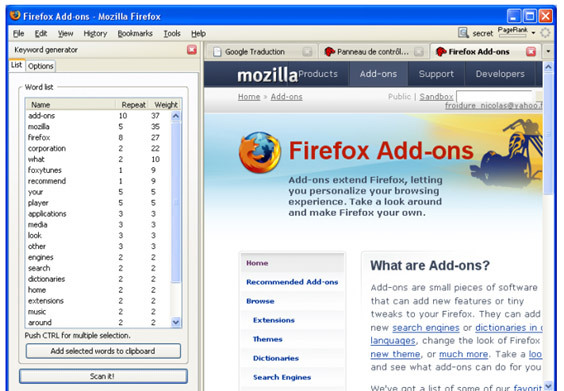 I'm a big fan of Firefox and one of the many things I love about this browser is the add-ons. I kind of see add-ons as the precursor to mobile phone apps. One of my favorite SEO add-ons available for Firefox is SEOQuake. As you can see in the screenshot below, SEOQuake gives you a wide variety of information for just about any webpage you land on. From left to right, you can see it taells you the Google Page Rank, the amount of links from Yahoo, Google and Bing, Alexa Rank and the age of the website. You can also click the many buttons for Who Is information, keyword density, etc. Other features tell you whether the site has a robot file and sitemap. There are plenty of excellent SEO tools available to SEO/SEM professionals. While this is a short list, there are many other high quality and effective tools available pretty much for all browsers. Definitely visit the above tools as well as do some research for the others available. It can instantly streamline your research and give you essential information about your own site and others.